Broad Street, Rose Street, Merchant Street, Narrow Lane and Chapel Street in Peterhead were closed yesterday to make way for a crane to move in and remove nests and eggs from the rooftops. It is hoped the effort will deter gulls from returning, following daily reports of gulls attacking people and biting faces when trying to steal food. 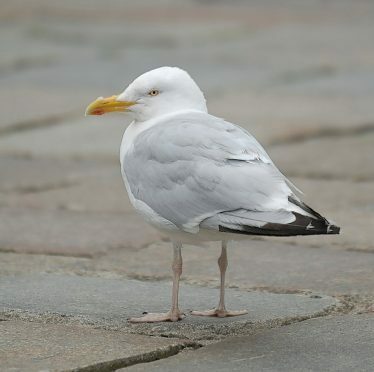 Rediscover Peterhead Ltd, Aberdeenshire Council and Presly Pest Control have been working to reduce gulls as part of the Business Improvement District (Bid) scheme. Iain Sutherland, manager of Rediscover Peterhead, called the creatures “alarming” and said he seen people with bleeding faces after being swooped. Mr Sutherland said: “We’ve still more to do but so far over 360 nests have been removed and more than 750 eggs have been taken away. “Even just with those eggs gone, that’s a lot of the possible gull population being taken care of. “It’s the most effective way to do it as the eggs are just not long laid before they are removed. Peterhead North councillor Anne Allan said: “It’s good to see that steps are being taken to reduce what is a huge problem – an annoyance isn’t a strong enough description. “Removing eggs is only part of the problem – we need the public to stop leaving food lying around and stop feeding them to lower the problem. The council granted the Bid £6,400 for the project. An Aberdeenshire Council spokesman said: “The Bid’s involvement has allowed a major expansion of the project, as they are match-funding a grant of £6,400 from regeneration funds, which will enable them to extend the area covered by the project to cover the whole area. “They will also be providing the service at no additional cost to individual businesses, as the BID’s contribution will be funded through the levy. The project will end in July.